Over the years, I would occasionally come across a photo or two of the homes of Picasso biographer and art historian, Sir John Richardson. 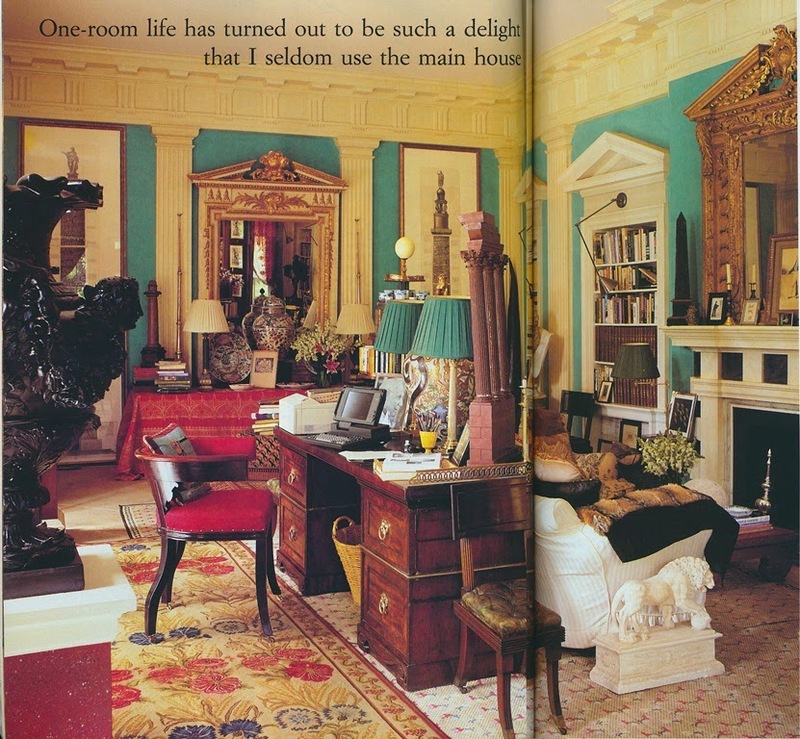 The few photos that I found were enough to intrigue me, such was the comfortable elegance of his homes. One photo, which was taken in his country house, showed a table that was laden with books and objects. The wall behind it was a memorable shade of turquoise blue. Another photo captured one room of his set at Albany, a room that was outfitted in refined antiques. 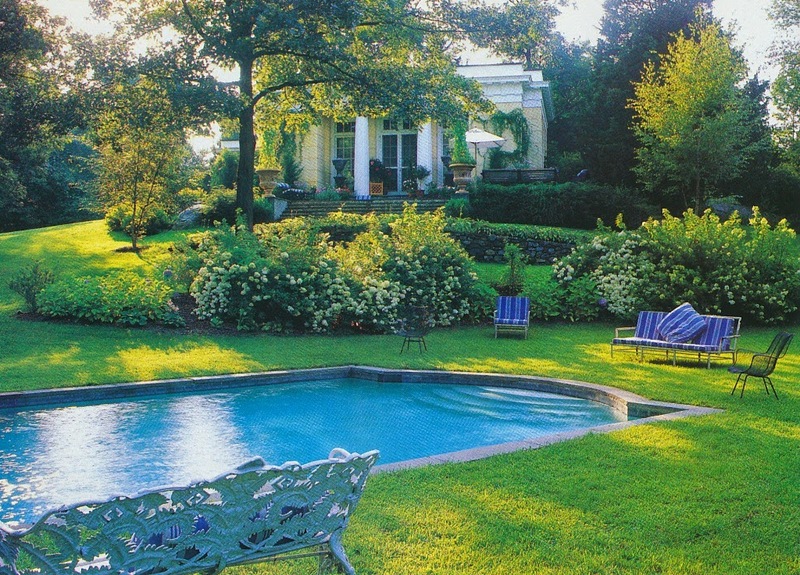 As appreciative as I was of the few photos that I had found, I was left wanting to see more of Richardson's handsome homes. 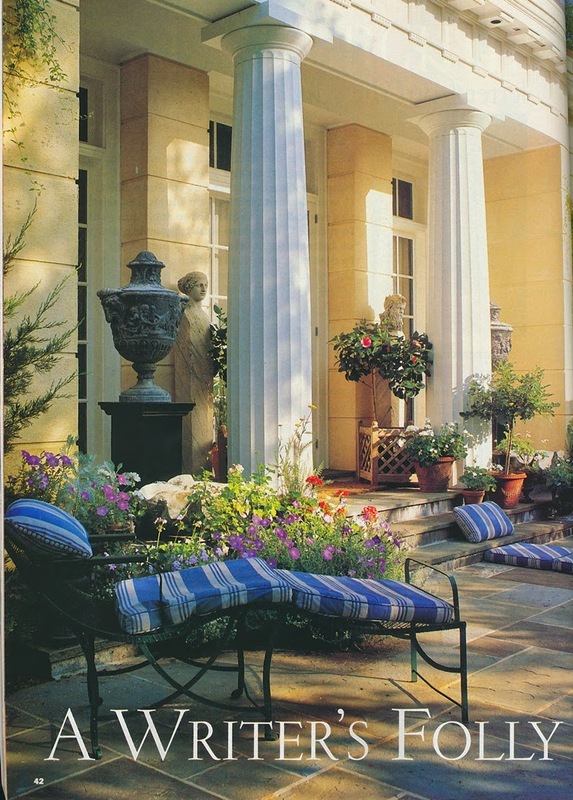 And then yesterday, while flipping through a twenty-year old issue of HG, I found an entire article that was devoted to Richardson's house in New England. (Based on what I have read elsewhere, I believe that this house might be located in Connecticut, but I can't be sure.) Actually, the article wasn't so much about the house itself as it was about his then-newly built folly library, which provided Richardson with a place to write, read, and relax close to the big house. The folly was designed in the classical manner and was inspired by Karl Friedrich Schinkel's Neue Pavillon at Charlottenburg in Berlin. The structure's classic architecture extends to its interior, whose walls are punctuated with pilasters, a beefy cornice, and pediments. And speaking of those walls, they are painted in the most beautiful, vivid shade of blue. 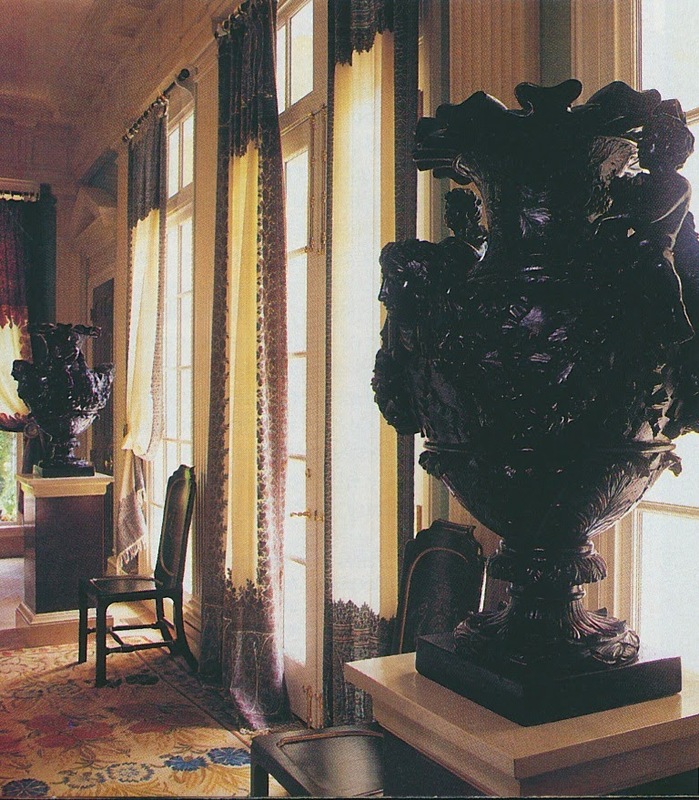 Richardson had wanted "the luminous verdigris tint of certain nineteenth-century Russian rooms", which unfortunately turned out to be difficult to replicate. Instead, his talented painter came up with the solution of painting the walls an icy shade of blue and then treating them to a shagreen-colored glaze. Richardson wrote that his folly proved so comfortable that he rarely spent time in the main house. After studying these photos, I can understand why. A delightful posting for a moral satisfaction staring one in the face. Irrespective of this domestic composition one thing stands out which must be completely gratifying, and that is the impression that someone who has accounted for invaluable edification of others, and companionship in their curiosity, can find comfort. Laurent, I think that you are quite right. The room not only provides material comfort, but intellectual and emotional solace as well. One of my all time favorite rooms. Will, This room looks like you, I must say. An extraordinary building filled with extraordinary things--quite wonderful, that folly. Charlie Rose. It was as much about the room itself as it was about its subject. Toby, Thank you for alerting me to this. It would be worthwhile for me to locate a copy of this interview. Perhaps on YouTube?? One of my favorite rooms, too. 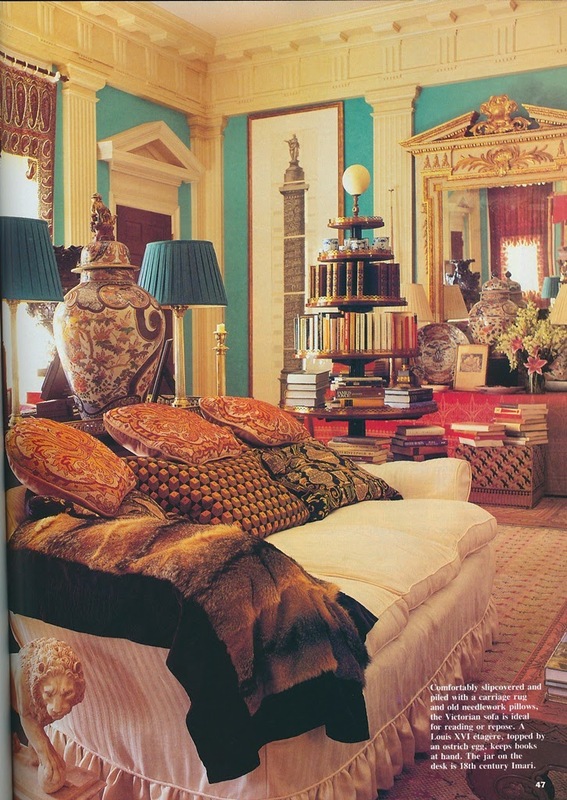 Classicist, It is such a memorable room. 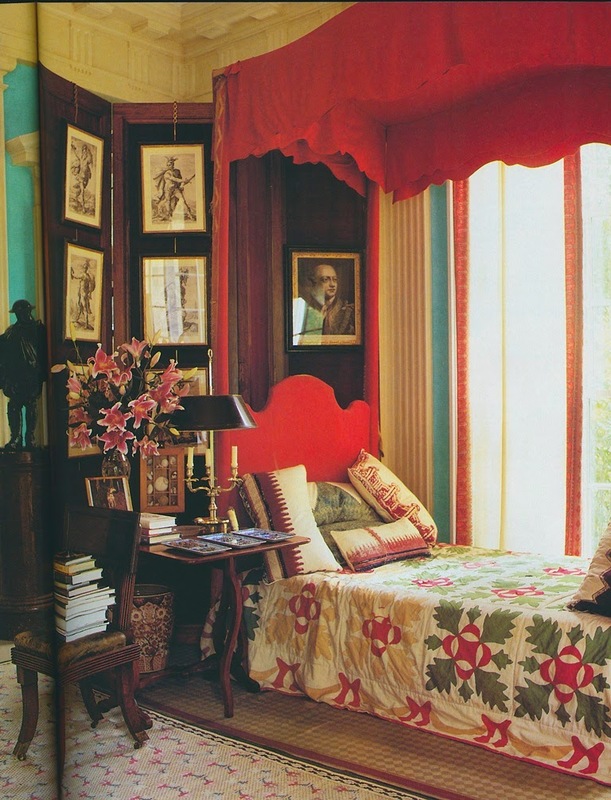 It's the sum of the room's parts that make this the handsome room that it is. Dear DC.. Perhaps as a little part of your Travellers series: notice the grand Kentian mirror over the fireplace. In the HG article, JR noted that it was a loaner from a friend who couldn't get it into her apartment. The friend? Annette de la Renta .. See pics of the de la Rentas beautiful country bedsit (done by the same architect, probably 5 years after) shows the same mirror. Your blog is not only beautiful, but educational and informative. Thank you. Yes, I could move right in and never leave. Such a wonderful room filled with moments of a life well-lived. If you find where one can see that interview, please let us all know! Beautiful space! Thanks for sharing. Perhaps all writers crave a room of their own. I have this clipping in my files - boy do I miss HG. One room living is really quite magical. In some ways I still miss my little studio downtown where everything was within arm's reach! I am speechless! This room, Richardson's vision, the collections.......all the best of the best. One of my favorites! Can't ever get away from the cluttered look. Just love it. I miss HG and Southern Accents. They were such beautiful magazines. Gorgeous in every way; what a brilliant room! I am speechless! Thank you for this treat!!! Dying to watch the interview! !